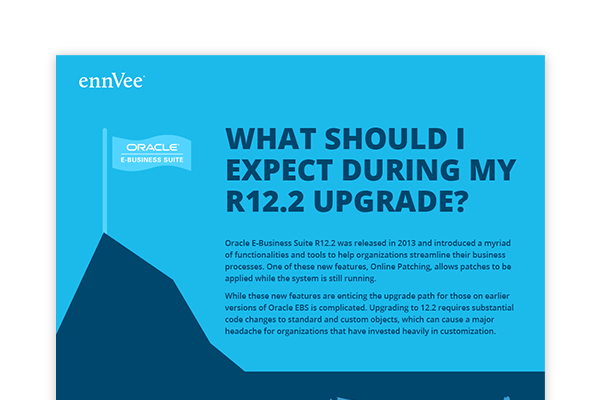 What should I expect during my Oracle E-Business Suite R12.2 upgrade? What Should I Expect During my Oracle EBS R12.2 Upgrade? Did you know that 82% of IT leaders believe it will take at least 6 months to upgrade to R12.2? In this infographic, survey responses were collected from more than 500 IT leaders ranging from IT management to the C-Suite. The objective was to capture the expectation or experience of upgrading to Oracle E-Business Suite R12.2. A breakdown of the respondents by role, industry, and company size. From prep work to code remediation, downtime, fixing post-go-live defects, and more. How long does the average R12.2 upgrade take? The average or expected duration from start to go-live. How much customization Oracle EBS customers have made to their environment. The availability of internal tool and processes to automate upgrade tasks such as code remediation, object migration, and testing. Download our complete R12.2 Upgrade Resources Bundle .